I am 99% sure that I am a Feta Cheese addict. I absolutely love the stuff. This cheese seems to find its way into, onto or near at least a couple of meals each week in my little corner of the world! It just has SO much flavor in such small amounts! 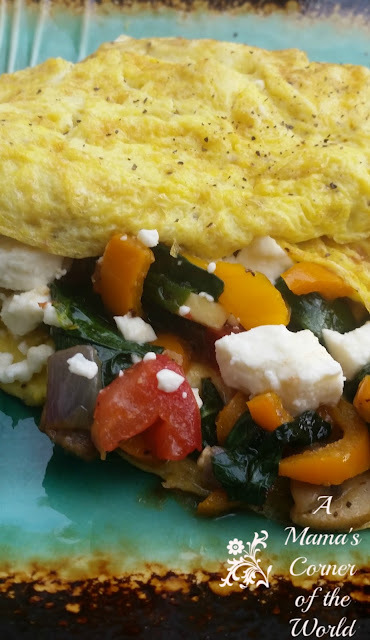 This morning, I am planning ahead for the busy week ahead and a few easy breakfast omelettes--so, I am cooking up 4 or 5 servings of this spinach, feta, and fresh veggie omelette filling and planning to whip up a few omelettes or breakfast scrambles over the next couple of days. 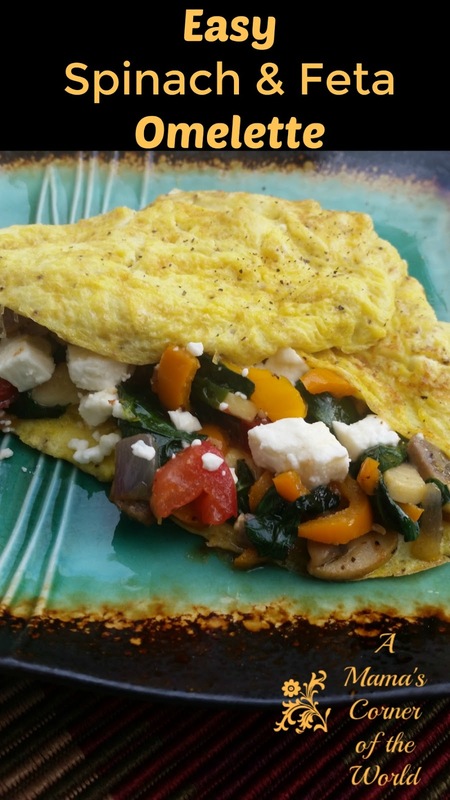 What is my recipe for a quick and easy breakfast with this spinach and feta omelette idea? Saute the Veggies. Some people find red onions a little strong for breakfast-so feel free to omit vegetables or sub in more mild variations (such as sweet onion). Simply preheat the olive oil in a saute pan over medium heat until hot. Add the chopped onions, peppers and mushrooms and saute until crisp-tender--or until the reach your desired texture. Add in the spinach and tomatoes. Season with the 1/2 tsp. of the Greek Seasoning. Saute until the spinach wilts. Set aside--but, keep warm. Prepare the Omelette Base. Whisk together 2 eggs, 1/2 tsp. Greek Seasoning and 1 Tbsp. Milk in a small bowl. Preheat an omelette pan with 2 tsp. butter (or margarine) until melted and the pan is hot. Pour in the egg/milk mixture. Spread the egg mixture evenly across the bottom of the pan. Allow the egg mixture to firm up a bit--then move the egg from the sides of the pan gently toward the middle--letting the liquid move toward the edges to firm up. Allow the omelette to mostly set through. Serve. Sprinkle with salt and pepper, if desired. Serve with toast.